EDITOR’S NOTE: This post marks the final in a series of six stories that focus on a Hammond, Minnesota, family forced from their home during a September 2010 flash flood. Today we look at Hammond, its recovery and how you can help. “WE HAVE A LONG ROAD ahead of us and none of it can really start until spring,” says Tina Marlowe, assessing the work that still needs to be done in Hammond. Her family returned to this town of (once) 230 residents shortly after Christmas. This southeastern Minnesota community exists in limbo as residents await the arrival of warmer weather, and money, to begin rebuilding their community. Many homes must be gutted and rebuilt or torn down. Hammond needs a new city hall and new maintenance equipment. The river bank, river bed, parks and canoe landing need to be cleaned and rebuilt. “Everything…everything is left to be done,” says Tina, who plans to help form a park committee that will raise $200,000 to update and rebuild the town’s parks. Tubing, canoeing, a horseshoe tournament, camping, fishing, motorcycling and more draw locals and visitors to this quiet river valley, “a beautiful gift of nature that we like to call ‘Our Valley’,” Tina says. She and good friend Katie Shones will be setting up a Park Fund for donations to rebuild the parks. 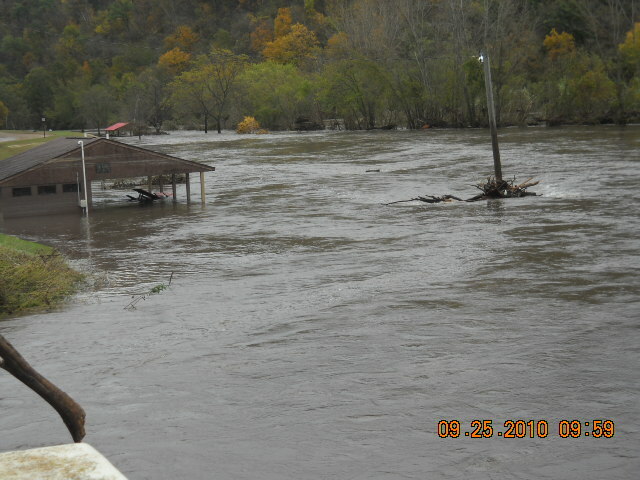 Hammond's riverside park was all but destroyed by the flood. Marks on the shelter roof show how high the water rose. A baseball field next to the shelter, with a fence around it, is covered by receding floodwaters. Jenny Hoffman took this photo at 10 a.m. on Saturday, September 25, 2010. “SINCE OCTOBER, Lutheran Social Service of Minnesota has been very involved in the long-term recovery efforts in the Pine Island – Oronoco area and in Wabasha County,” says Caitlin Hughes, LSS Disaster Services administrative specialist. “LSSMN assisted in the development of two community supported long-term recovery committees. These committees are working with the LSSMN Southeast Minnesota Disaster Response Team to help families locate the precious resources to rebuild their homes and their lives. Presently LSSMN has a local staff of three disaster case managers, a volunteer and resource coordinator and a reconstruction manager. St. John’s Lutheran Church is serving as a base for LSS relief operations in Hammond. Contact LSS caseworker Mary Walker at 507-753-3057 business days. St. John’s has served, among other functions, as a site for distribution of food, clothing and other essentials to flood survivors. INDIVIDUALS INTERESTED in helping with Hammond’s recovery should contact LSS Volunteer Coordinator Dan Kalstabakken at 651-741-7234. Also visit the Zumbro Valley Disaster Relief Fund. Tina says flood survivors could use cash donations and that skilled laborers are still needed to help with the ongoing rebuilding efforts. LSS also provides support for children who have been through disasters like the Hammond flood. Camp Noah is a day camp for children impacted by disaster that offers children a safe, caring and fun environment where they can heal and process their disaster experience, according to LSS. The five-day camp is based on a curriculum that celebrates each child’s unique gifts and talents and provides them with an opportunity to share their story. This photo shows the destroyed road that goes from Wabasha County Road 11 to the business area on the east side of Hammond. A bar, bank, cafe, city hall and homes are located along this street. Waters are receding in this photo taken mid-morning on Saturday, September 25, 2010. 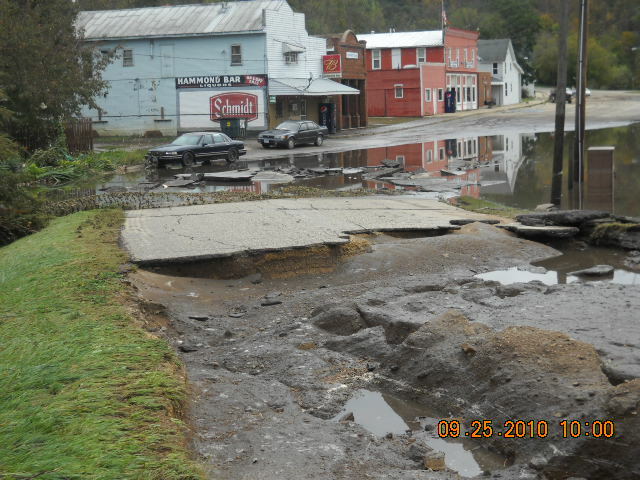 All of the businesses, city hall and most homes along this road were flooded. Tina and her fiancé, Micheal Mann, are planning a June 25 wedding. The bride will wear the wedding dress she saved from the floodwaters. “I don’t know how we will get the wedding paid for now…it certainly won’t be all that I planned it to be,” Tina says. THIS CONCLUDES my six-part series of stories told through the voice of Hammond flood survivor Tina Marlowe. Thank you, Tina, for the privilege of sharing your story. I admire your strength, your determination and your resiliency. Thanks also to Katie Shones, who has been my main contact in Hammond since last October. She is one strong, kind woman. Thanks, too, to Susie Buck for pulling together the many photos featured in this series and to those who allowed their images to be published here. Sheri Ryan, I am grateful to you also for the use of your photos, but, more importantly, for a deeply personal look at how this flood affected your mom. All too often we view blurs of faces and piles of debris, but we fail to see beyond, to the real hurt that runs deep. I appreciate every one of you who have so willingly worked with me to tell the story of the people of Hammond through words and photos. I also appreciate volunteers like Gary Schmidt from the Twin Cities who worked with a Woodbury church to bring volunteers to Hammond in late January and then again one day in March. Gary learned of the need through this blog. I hope to share Gary’s experiences with you in a future post. MPR columnist Bob Collins summarized my series and linked to my blog in the “5×8” section of his March 18 “News Cut” column. Bob also publicized my first set of flood stories back in October 2010, when I toured Hammond and Zumbro Falls about two weeks after the flash flood. Thank you, MPR, for helping Hammond’s story reach an even wider audience. It is my hope, Minnesota Prairie Roots readers, that the flood stories I’ve shared with you this week will touch you. I hope you will be moved to help the residents of Hammond recover from a flood that may have damaged their homes, but has not destroyed their spirits. These are strong, strong people who continue to need our support, our prayers and our help even six months after the flood. Thank you for sharing Tina’s story with us. It gives the whole tragedy a face so to speak. I wish her luck with her wedding. It may not be everything she had dreamed of, but with her plucky attitude it will be even better! That camp Noah is a wonderful idea and great name. I was honored that Tina would entrust her story to me. It needed to be told. And she shared her experiences with such depth, honesty and openness. Not many others would do that publicly. Yes, she is plucky…and strong. I too love the idea of Camp Noah for the kids.